Several New York “furious” Democrats have mulled whether they want to primary challenge Rep. Alexandria Ocasio-Cortez (D-NY) and make her a “one-term congressperson,” according to report released on Tuesday. A report from the Hill released on Tuesday suggested that several Democrats have considered if they want to primary challenge Rep. Ocasio-Cortez, a progressive freshman Democrat and a rising figure in Democrat circles. Reportedly, at least one House Democrat has urged the New York delegation to recruit a local politician from either the Bronx or Queens, New York, to challenge the progressive Democrat. “What I have recommended to the New York delegation is that you find her a primary opponent and make her a one-term congressperson,” the Democrat congressman said anonymously to the Hill. “You’ve got numerous council people and state legislators who’ve been waiting 20 years for that seat. I’m sure they can find numerous people who want that seat in that district,” the lawmaker added. 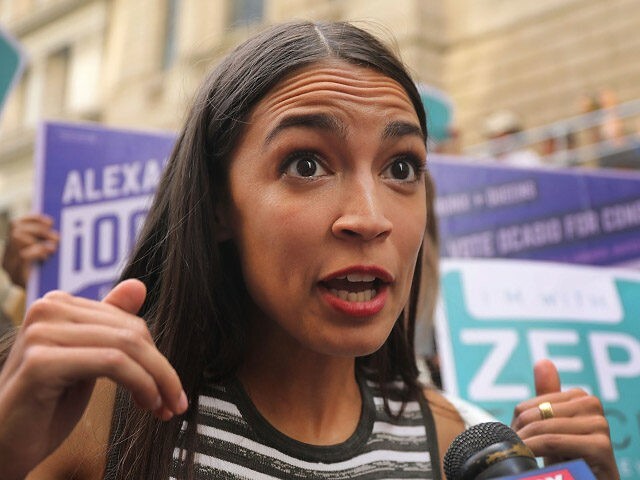 Ocasio-Cortez quickly fired back at the report, suggesting that voters want change and that many Democrats remain disconnected from the Democrat base. That broken mentality, that public office is something you wait in line for, instead of earning through hard organizing, is exactly what voters want to change. Corbin Trent, a campaign spokesman for Ocasio-Cortez and a co-founder of Justice Democrats, said they would welcome a primary challenge against her. “We believe in primaries as an idea. We’re not upset by the idea of being primaried. We are not going to go out there being anti-primary — they are good for the party,” Trent said. Ocasio-Cortez stunned the Democrat establishment and pundits when she defeated former Rep. Joe Crowley (D-NY). Crowley, who was first elected in 1999, had been considered as a possible future Speaker of the House. The progressive Democrat also inflamed controversy within the Democrat Party after a recent Politico report suggested that she and the progressive group Justice Democrats considered a primary challenge against Rep. Hakeem Jeffries (D-NY), a Congressional Black Caucus (CBC) member and member of House Democrat leadership. Ocasio-Cortez and Justice Democrats dispute the Politico report; however, many Democrats have also said they will target Rep. Henry Cuellar (D-TX) and other 2020 primary challenges. Some members of the New York Democrat delegation have disputed the report about primarying Ocasio-Cortez. We are going to see what happens. Generally for me, I’m giving folks the benefit of the doubt, the presumption of innocence. You might say one thing before you get in here, and then after you get to meet folks, you see what happens and how the body works … things are different, so we’ll see what happens. Jeffries said that no House Democrats have approached him about primarying Ocasio-Cortez and also suggested that many New York Democrats pushed to get the progressive Democrat on the House Financial Services and Oversight and Reform Committee. “I don’t think that is something the New York delegation would contemplate. As you can see, we are totally united behind each other. … The New York delegation sticks together,” Jeffries said. However, one New York political insider close to Crowley said that there remain many ambitious politicians who do not like that Ocasio-Cortez ousted the former congressman. Justice Democrats spokesman Waleed Shahid said that Ocasio-Cortez could handily defeat any primary challenger who might decide to run against her.